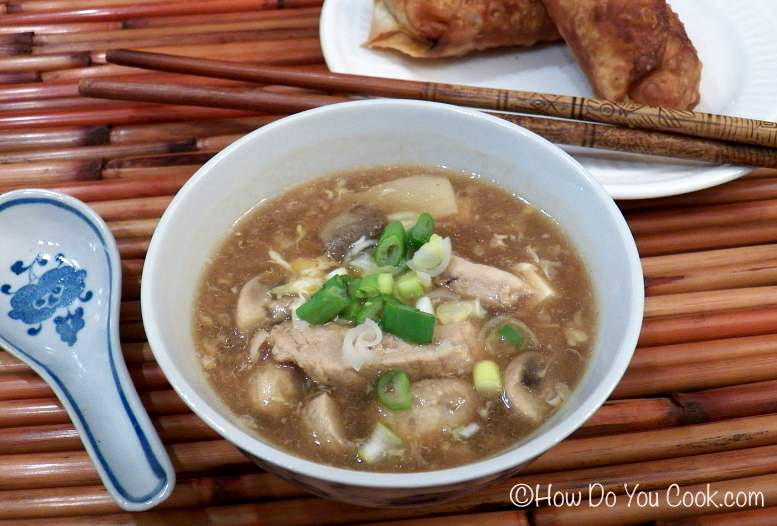 For day #25 of Soup Month, this version of the classic Oriental Hot and Sour Soup turned out very well. I did have to improvise on some of the ingredients as locally it is impossible to find black mushrooms or black chinese vinegar﻿! The substitutions worked great and the soup had that familiar hot-sour-spicy flavor that I just love. We enjoyed this soup with crispy, crunchy homemade Egg Rolls. Mix the vinegars, soy sauce, salt and sugar in a small bowl and set aside. Mix the cornstarch and water in a small bowl and set aside. Heat oil in a large soup pot over medium-high heat. Add the mushrooms and brown for 2 minutes. Next add the pork and saute, turning frequently, about 4 minutes or until the meat is nearly cooked through. Add the bamboo shoots and the broth and stir to combine. Add the tofu and stir, heating 2-3 minutes until the broth comes to a boil. Next add the vinegar mixture and the cornstarch mixture and stir until soup thickens. Turn heat to low-medium. While stirring the soup very gently, pour in the eggs in a thin stream. When the eggs are in the soup let the eggs rest and cook on top of the soup about 1 minute. When the eggs are set, stir in the white and black peppers, sesame oil and the Sriracha. Serve garnished with green onions. I like to make all kinds of soups, but always order Hot & Sour Soup when out. Thanks to your great-looking recipe, I will be trying this one at home! Allen. 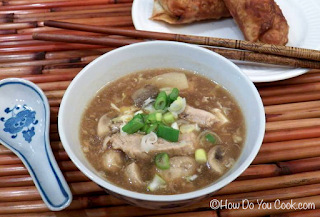 It took me many tries to get the flavors just right in this soup and it tastes just like the take-out version..only better! Thanks for visiting and enjoy the soup. Always one of my favorites!